A California judge on Tuesday threw out a 2016 state law allowing the terminally ill to end their lives, ruling it was unconstitutionally approved by the Legislature. 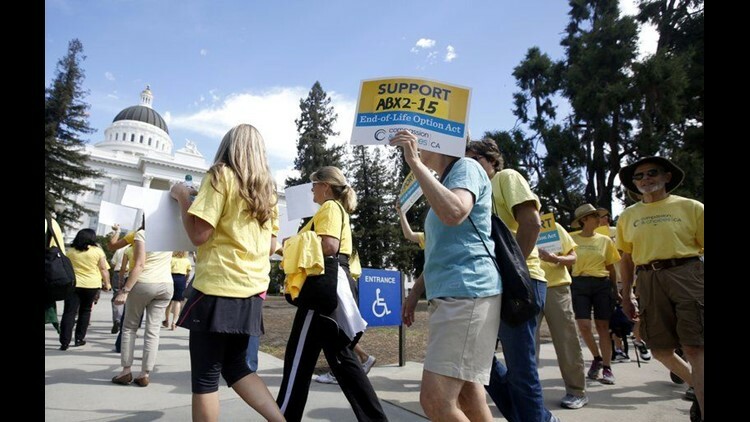 In this Sept. 24, 2015 file photo, supporters of a measure to allow the terminally ill to end their own life march at the Capitol while calling on California Gov. Jerry Brown to sign the bill in Sacramento, Calif.
SACRAMENTO, Calif. (AP) — A California judge on Tuesday threw out a 2016 state law allowing the terminally ill to end their lives, ruling it was unconstitutionally approved by the Legislature. Riverside County Superior Court Judge Daniel Ottolia said lawmakers acted illegally in passing the law during a special session devoted to other topics, said lawyers for supporters and opponents. He did not address the legal issue of whether it was proper to allow people to take their own lives, and gave the state attorney general five days to appeal. Attorney General Xavier Becerra’s office did not respond to calls and emails seeking comment. The Life Legal Defense Foundation, American Academy of Medical Ethics and several physicians challenged the law, which allows adults to obtain a prescription for life-ending drugs if a doctor has determined they have six months or less to live. The plaintiffs say the law lacks safeguards to protect against abuse. California health officials reported that 111 terminally ill people took drugs to end their lives in the first six months after the law went into effect June 9, 2016, and made the option legal in the nation’s most populous state. Oregon was the first to provide the option in 1997. It also is allowed in Washington, Vermont, Colorado, Hawaii and Washington D.C.
Compassion & Choices, a national organization that advocated for the law, estimated that in its first year 504 Californians requested prescriptions for medical aid in dying, but had no further update Tuesday. The next report on how many people took the drugs is due in July. “Our supporters, they’ve frankly expressed shock at this outcome. They’re disappointed that this end of life option could be taken away,” said John Kappos, an attorney representing Compassion & Choices. Alexandra Snyder, an attorney and executive director of Life Legal Defense Foundation, said the judge ruled that lawmakers effectively “hijacked” a special legislative session that was called to address access to medical care and used it to pass their bill. “Access to health care has no relationship to assisted suicide,” she said, saying it set a dangerous precedent that undermines the legislative process. Democratic Sen. Bill Monning of Carmel, who carried the original legislation, said the bill was properly considered in the special session and followed “every rule of transparency and openness.” Lawmakers could try to pass it again if the law ultimately is rejected by the courts, he said. Kelly Davis’ 41-year-old sister, Betsy Davis, was one of the first to use the law as she was dying of Amyotrophic lateral sclerosis, commonly known as Lou Gehrig’s disease, that slowly robbed her of her ability to use her muscles including to swallow and communicate. She held a two-day party in Ojai to celebrate the end of her life with about two-dozen friends, giving away her possessions and ordering her favorite foods. The state’s attorney general’s office said in court papers that medical professionals have the right to refuse to prescribe and dispense the drugs. Under the law, the terminally ill person must be able to self-administer the drugs.